Pre-Rally festivities begin at the carousel building. In operation since 1909, The Highland Park Carousel is a National Historic Landmark and the world's only two-row stationary Dentzel menagerie in existence. 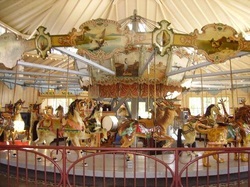 Manufactured between 1892 and 1899 by Gustav Dentzel of Philadelphia, Pennsylvania, the carousel is listed on the National Register of Historic Places. Original oil paintings of museum quality adorn the top crown of the Carousel. All animals are meticulously hand-carved of bass and poplar wood. This historic Dentzel Carousel was built for St. Louis World’s Fair and later sold to the City of Meridian in 1909 for $2000. It has occupied the same location in The Highland Park Carousel House since that time. It is the only remaining carousel house built from a Dentzel blueprint. In 1977 Highland Park and the carousel were placed on the National Register of Historic Places. In 1986 the Department of Interior designated the carousel and carousel building as a National Landmark. This honor has been given to only 11 carousels and this is the only one in the south. From 1984 through 1995 the carousel underwent a complete restoration and repainting returning it to the original colors. The entire restoration was done by Rosa Ragan Patton of Raleigh, N. C. Restoration of the carousel was $112,000 while the restoration of the carousel building was nearly twice that amount. 8th Street; Follow signs to The Jimmy Rodgers Museum in Highland Park.